Swamp Thing #5 continues the all new 6 part mini-series written by co-creator and legendary writer Len Wein and featuring the stunning artwork of Kelly Jones, Swamp Thing has been a gloriously dark and mesmerising horror adventure. 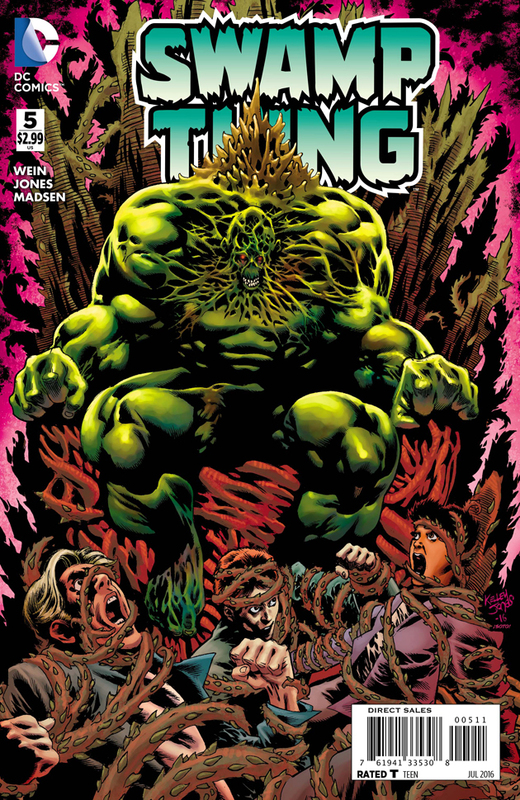 The sinister brooding tone of the early issues has now become a frenetic supernatural race against time, with the power mad Matt Cable now transformed by The Hand of Fatima into Swamp Thing, and sending the tendrils of his influence out across the world from his throne of thorns in Houma, Louisiana. Having consigned the former Swamp Thing Alec Holland to his doom in the very depths of the earth itself, it seems that nothing can now prevent this dark Swamp Thing’s heinous scheme to rule the world. 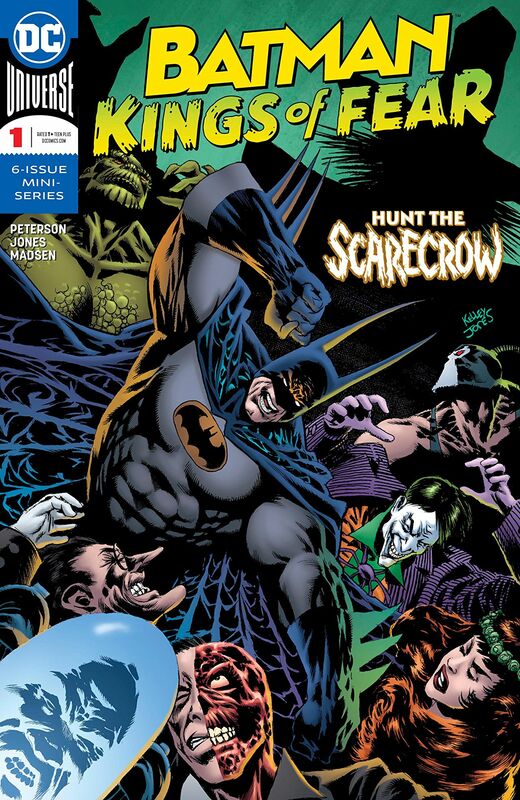 Len Wein weaves an intricate series of spellbinding developments into this fantastic issue. The full scope the new Swamp Thing’s warped designs are truly chilling, Len Wein elevates this new slant on the body-swap scenario to a whole new level with this issue, and sprinkles it with magic and powerful supernatural cameos with every twist and turn of the plot. This is brilliant stuff, Alec Holland’s mission is set out before him in a way that ultimately leads to a potential solution to prevent the apocalypse, and we get a plethora of horror tropes, all skilfully intermingled within the wider context of the DC Universe itself, supernatural shanghais punctuate the narrative, there’s a welcome guest appearance from Deadman, together with one or two other acquaintances of Swamp Thing along the way too, and there’s even a fun Scooby-Doo reference as well. I’m a huge fan of Kelly Jones’ artwork, and this issue looks every bit as incredible as the previous issues in this mini-series. The evil Matt Cable / Swamp Thing looks suitably hideous and menacing, and the way his powers reach out across the globe are well realized. It is Alec Holland’s quest where Kelly Jones really excels in this issue: from the audience with the Parliament of the Trees, to the uncanny transportation from cornfield to the mountainous frozen heights of Nanda Parbat, every scene flows seamless into the next, and we are treated to a wonderful interlude with Deadman as well that turns out to be just one of the many highlights in this issue. Colorist Michelle Madsen’s distinctive blend of tone and shades are absolutely captivating, the dark gothic atmosphere of this mini-series has been beautifully heightened by Madsen’s colors, Deadman in particular looks awesome, and the scenes in the Himalayas are vivid and gloriously realized. Swamp Thing #5 delivers one further surprise before the closing moments, with a detour to a very familiar city… I’ve thoroughly enjoyed this mini-series, Len Wein, Kelly Jones, and Michelle Madsen are a dream team for this book as far as I’m concerned, every issue has been a ghoulish delight, oozing atmosphere, horror, and the macabre with sumptuous ease, and the covers by Kelly Jones and Chris Sotomayor have been stunning. With its brilliant story by Len Wein and incredible art by Kelly Jones Swamp Thing #5 now sets everything up for a thrilling showdown as the fate of the world hangs in the balance.